I hope you all have fun plans this weekend, or relaxing ones at least. I am having my parents over for dinner tonight to celebrate my mom’s birthday. This has been the month of birthdays…Kyle’s, Becca’s, my brother’s, my mom’s, her twin sister’s…& I’m probably forgetting a few more. 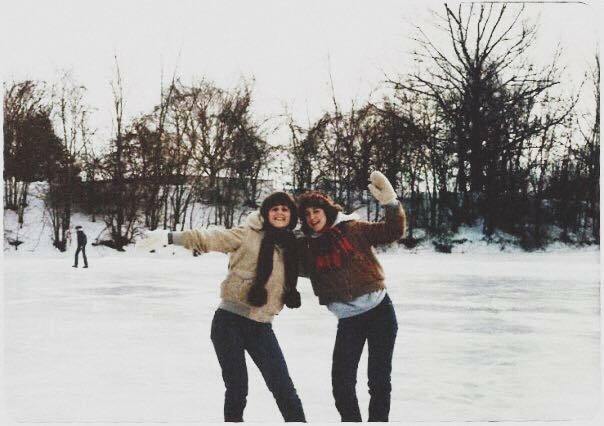 *Fun fact about my mom and her twin sister* They were born on different days! My aunt’s birthday is August 24th and my mom’s birthday is the 25th. I guess that saved my grandma from distributing her attention evenly on the birthdays. 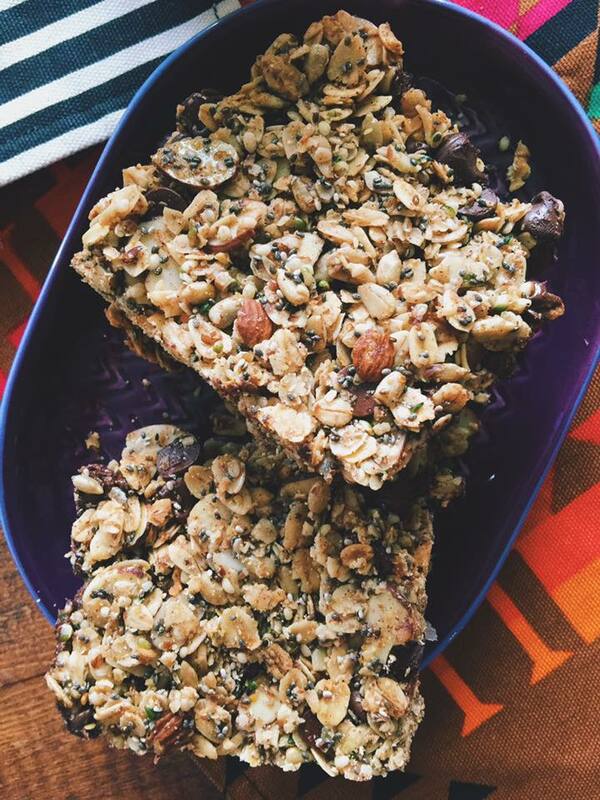 Anyways…I decided to make my mom super healthy & super tasty dark chocolate granola bars. 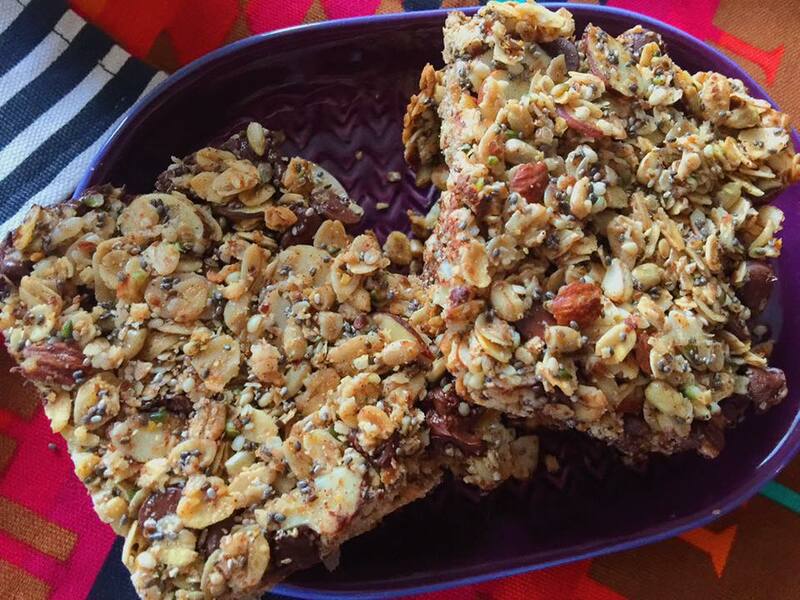 These granola bars are filled with so many healthy ingredients and they taste amazing! It’s the perfect way to get your protein, healthy fats, vitamins and other important nutrients into your diet, the delicious way. 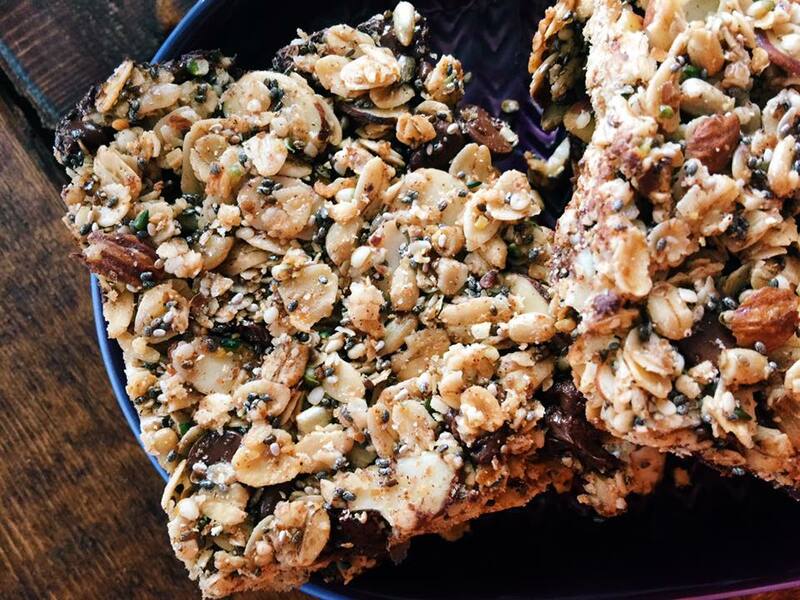 INGREDIENTS: 3 Cups Oats, 1/4 Cup Chia Seeds, 1/3 Cup Sliced Almonds, 1/3 Cup Hemp Seeds, 1/4 Cup Ground Flaxseeds, 1/4 Cup Sunflower Seeds, 1/2 Tablespoon Ground Cinnamon, 3 Packets Stevia, 1/4 Cup Butter (I used MELT, vegan option) 3 Tablespoons Coconut Oil, 1/2 Cup Honey (save some for the top coat drizzle), 8 Ounces Dark Chocolate Chips, 1/2 Teaspoon Sea Salt, 1 Teaspoon Almond Extract, 1 Teaspoon Vanilla Extract. 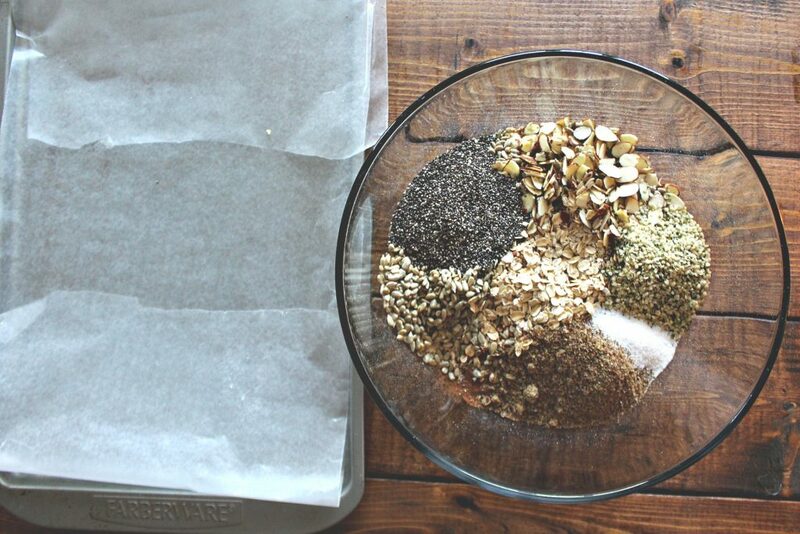 Add the cinnamon, sunflower seeds, flaxseed, stevia, oats, chia seeds, hemp seeds, and almonds to a large mixing bowl. Heat oven to 290 degrees. Grease a baking sheet or parchment paper. Add coconut oil and butter (MELT) to a microwave safe dish and heat for 30 seconds, or until melted. Stir in the vanilla, honey, and almond extract. Mix the butter and honey mixture into the large bowl with the dry ingredients. Stir in the dark chocolate chips. 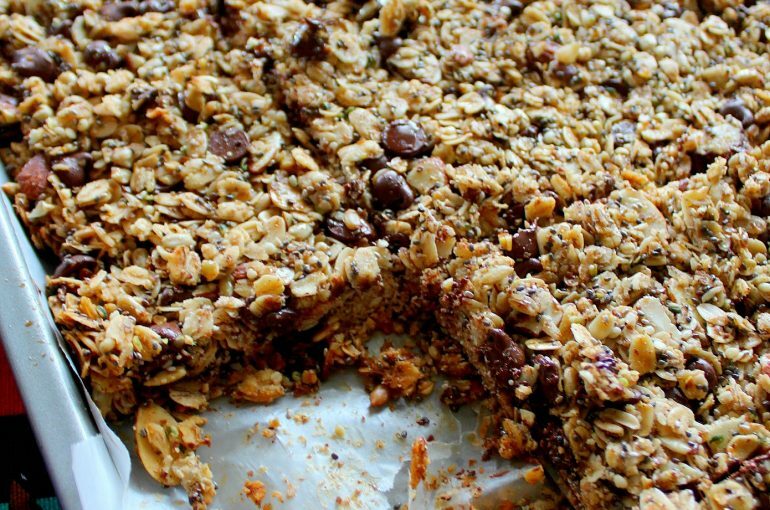 You can add all kinds of fun ingredients to the granola bars. 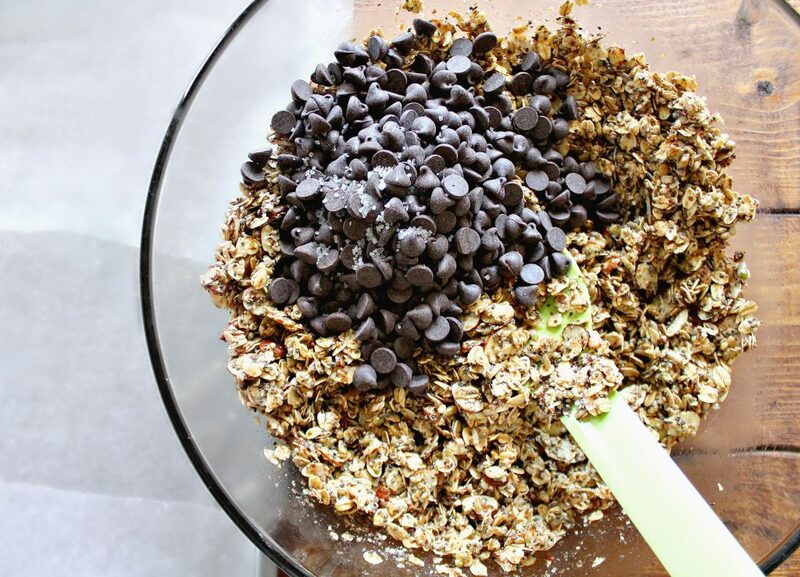 Add in dried fruit, mixed nuts, white chocolate chips, or peanut butter! 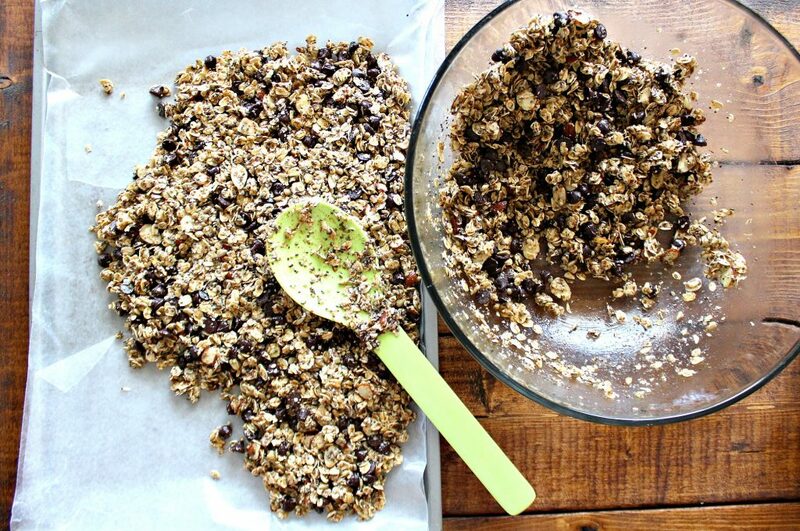 Add the granola to the baking sheet and spread it out evenly. 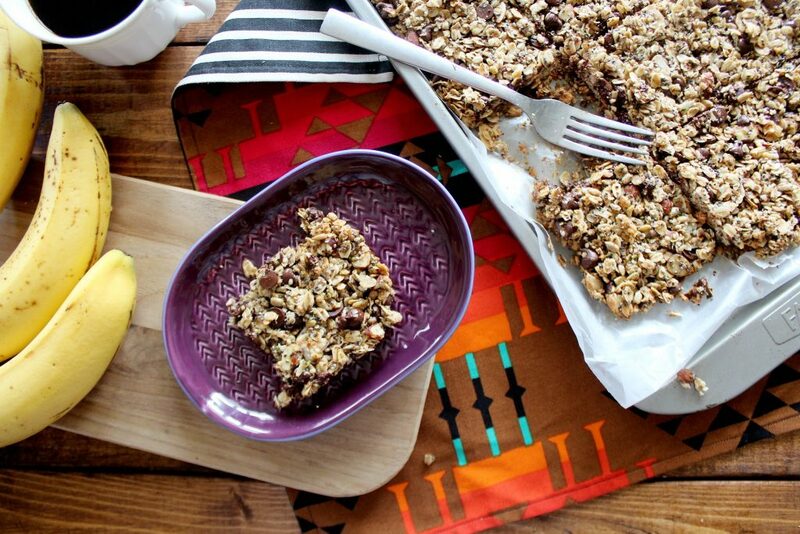 Drizzle honey over the top of the granola bars and place in the oven for 30 minutes. 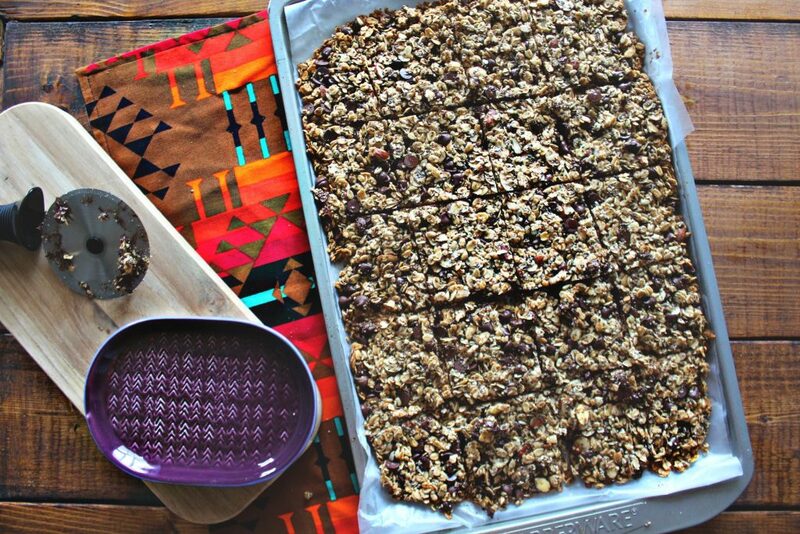 Keep an eye on the granola bars and as soon as the edges are SLIGHTLY golden, take them out and let them cool for about an hour or two! Once the bars are cool, slice them with a pizza cutter. 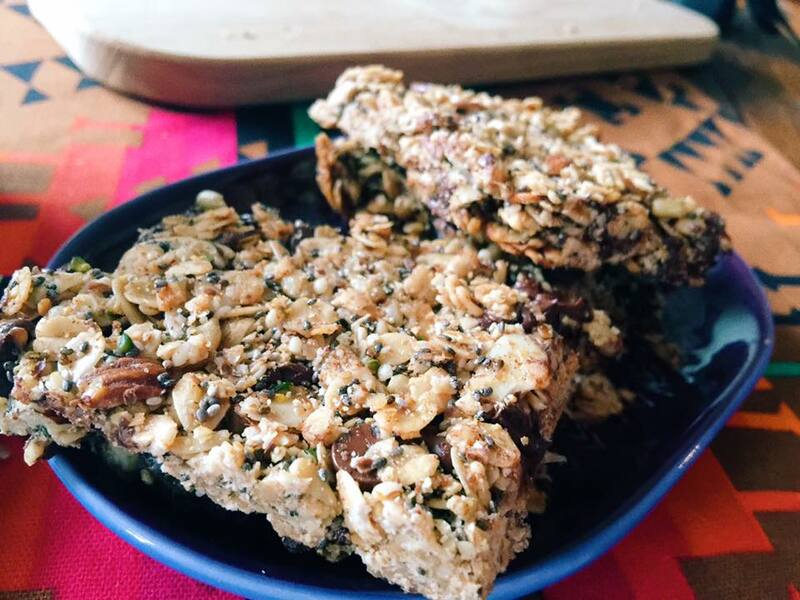 The bars make twenty 1/2 inch thick granola bars. I love that these are chewy in the centers and crunchy along the edges. He was being so cute while I was making these! 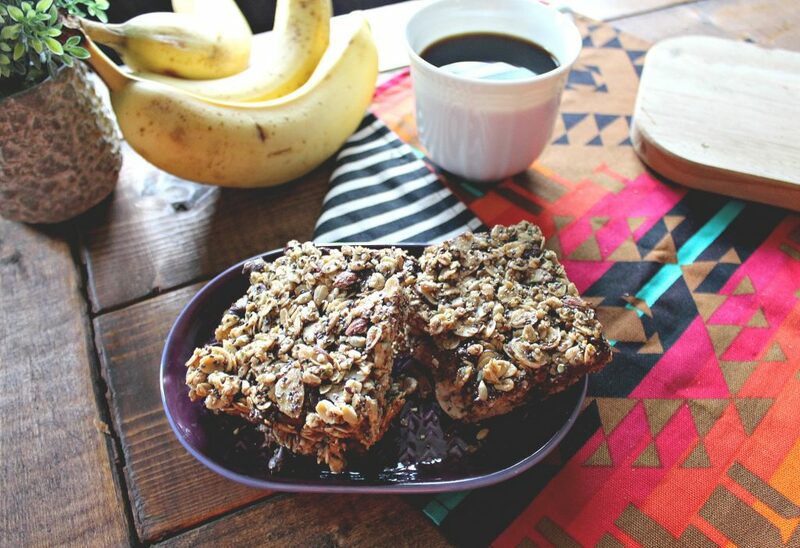 These are perfect for hiking, a gift, for breakfast on the go, or a late night snack. They are so good with coffee, crumbled over yogurt, or dipped in almond milk. 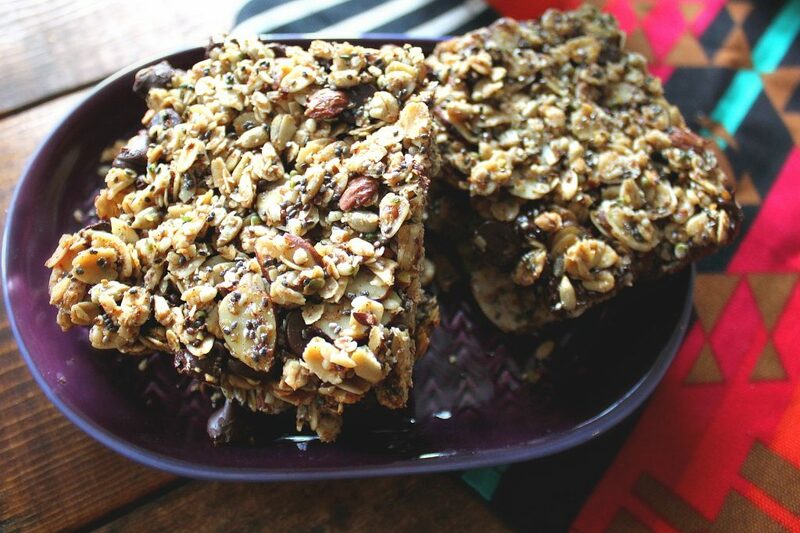 If you have guest coming over, or want to bring healthy treats (that taste good) to a friend…these are it! 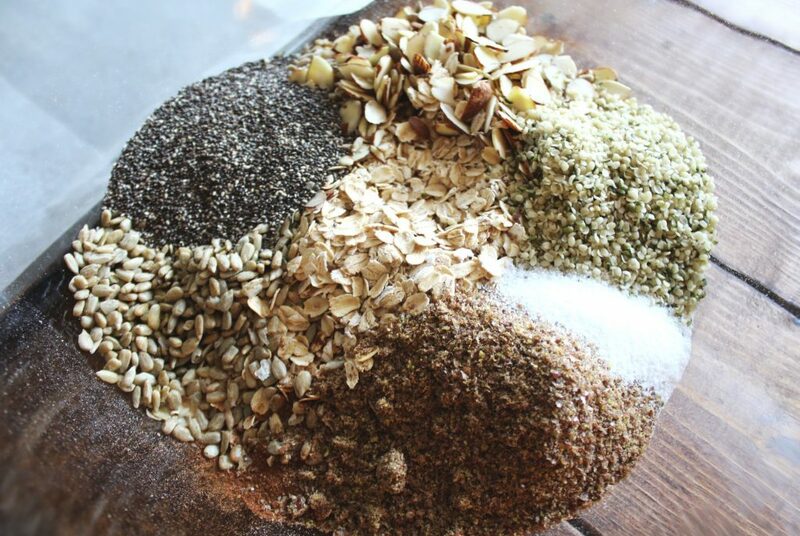 Add the cinnamon, sunflower seeds, flaxseed, stevia, oats, chia seeds, hemp seeds, and almonds to a large mixing bowl. Heat oven to 290 degrees. Grease a baking sheet or parchment paper. 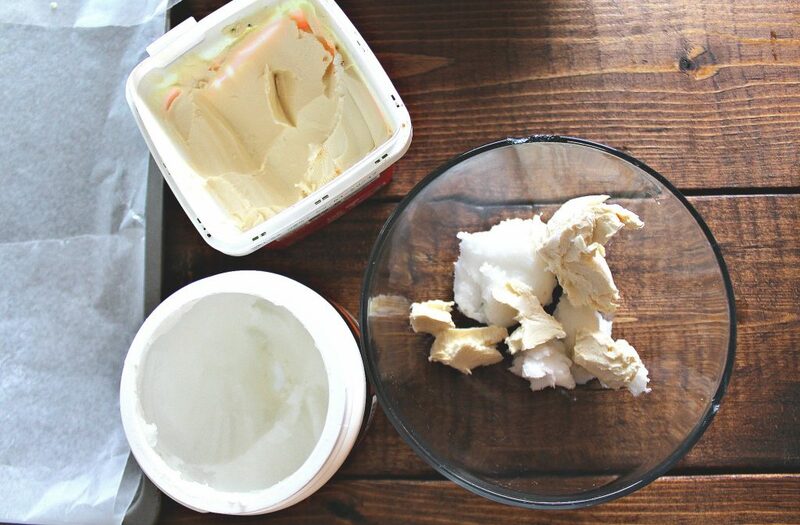 Add coconut oil and butter (MELT) to a microwave safe dish and heat for 30 seconds, or until melted. Stir in the vanilla, honey, and almond extract. 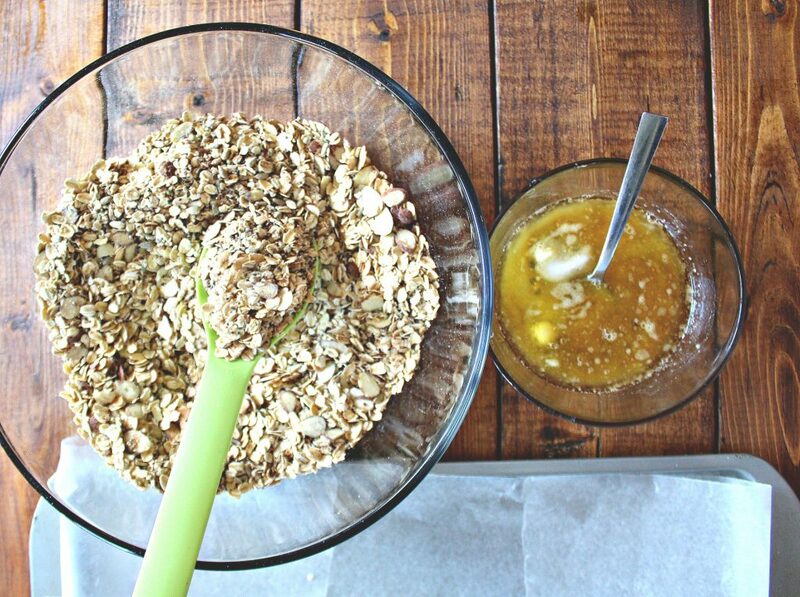 Mix the butter and honey mixture into the large bowl with the dry ingredients. 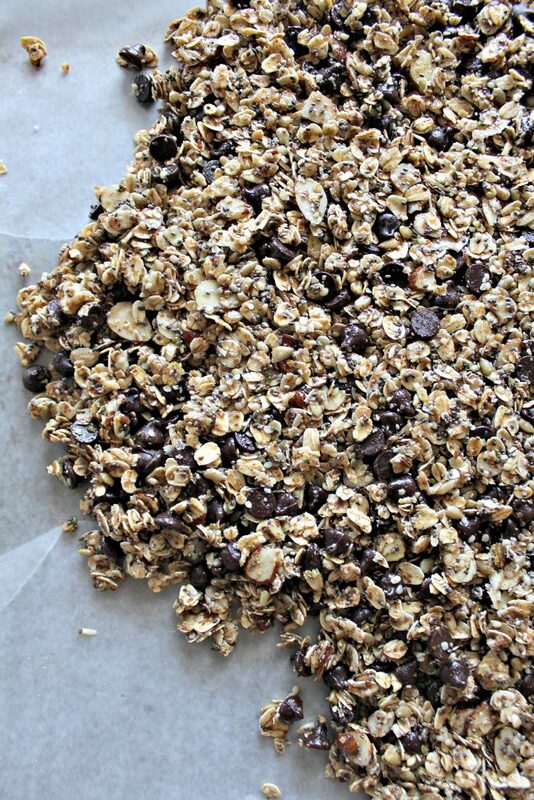 Add the granola to the baking sheet and spread it out evenly. 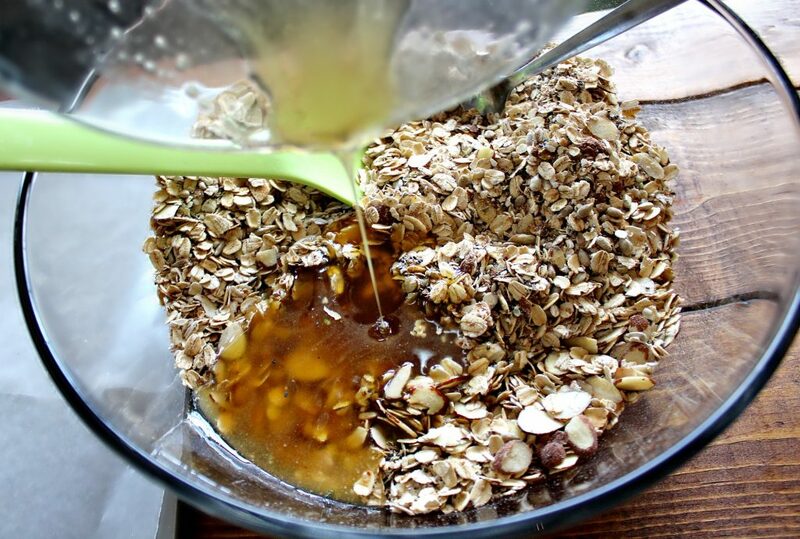 Drizzle honey over the top of the granola bars and place in the oven for 30 minutes. 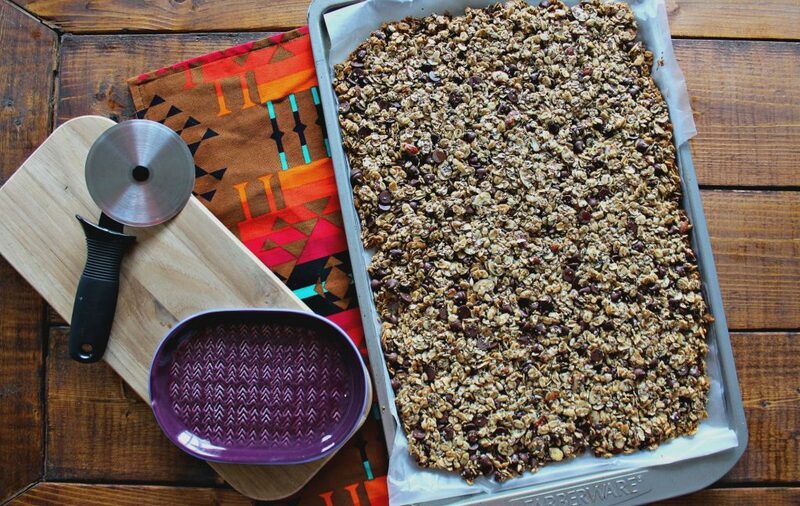 Keep an eye on the granola bars and as soon as the edges are SLIGHTLY golden, take them out and let them cool for about an hour or two! My next granola bar creation is gong to be a white chocolate macadamia nut flavor! 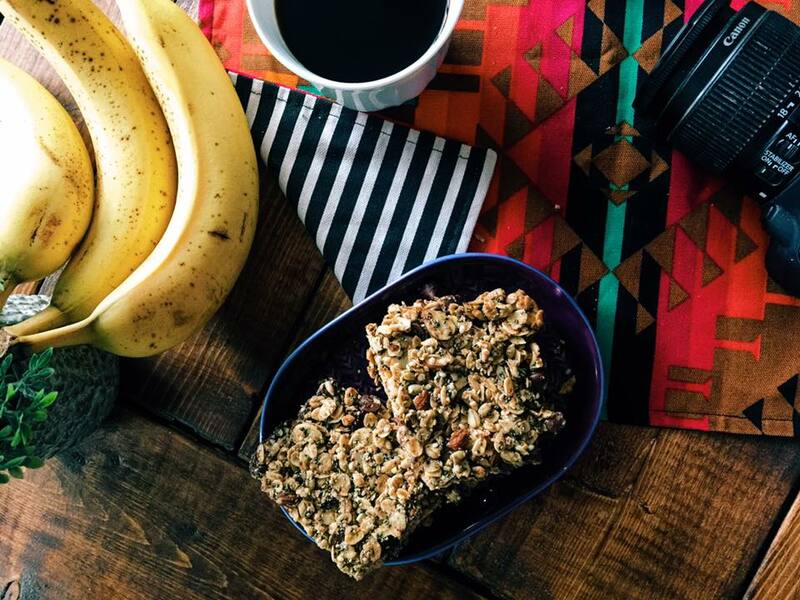 What is your favorite brand of granola bar? What month do you celebrate the most birthdays? These look delicious! I will surely be making a trip to the store for the ingredients so I can make them soon! I love lara bars and I grew up with cliff bars so they always take me back to outdoor childhood adventures. I celebrate most birthdays in the last half of march/early april (does that count as a month? ha). My husbands and best friends birthday are on the same day and my other friends birthday is a couple weeks later! My mom is a similar birthday situation as yours, her birthday is the 2nd her brothers is the 3rd… and her mom’s is the 1st and her dad’s the 5th… instead of a birthday month they have just a week of crazy! ha! As much as I love summer, I AM ready for fall! This summer has been much more hot and humid and its making me miss crisp fall days! Also anything pumpkin always makes me excited for fall! I can’t wait to find pumpkin cheerios!! 1. Larabars when I’m not making my own homemade bars. 2. They are mostly spread through the summer months. I don’t do a very good job at doing special things for my friends and family member like you do. 3. I am so ready for fall! I spent the last two weeks on the Mediterranean and it was super hot and humid so I was very thankful to come home to early fall weather. Fall is my favorite! I am so looking forward to fall, particularly because I have bought new clothes that I want to wear when the weather is cooler. It’s my favourite time of year, and the weather has been so warm here that it would be nice to have cooler days! Dark chocolate on top would be so good! These are pretty sweet. I added a lot of honey and some stevia packets! The dark chocolate chips adds a lot! I feel like fall may come sooner here:) It’s been nice at night and I’m getting in the mood! I want to wear the fall fashions too! This is the month of birthdays for me too! My fiance’s, my best friend’s, my aunt’s, and my mom’s all fall between August 20-29. It’s a fun (but expensive) couple of weeks! I have mixed feelings about the end of summer and the beginning of fall this time of year. I’m always sad to see summer go because it’s such a fun and laid back time of the year and here in New England I know I have a very long and cold winter to get through before it’ll be back, but I also LOVE fall! I’m so excited for football (I just drafted my first ever fantasy football team! ), apple picking, baking with my apples, boots and cooler weather. You have beautiful summer weather in New England! I feel like the weather is perfect in fall for us down south. 68-80 degrees is the norm. I’m ready for football season too! I can’t wait to go the pumpkin patches and apple picking this year! I love making my own bars but sometimes I feel like they take SO much work! These remind me of Kind bars though, which are my favorite. For birthdays, in my group we start in March with my husband and end in May with me, celebrating over 20 birthdays of friends and family members in between. It gets very expensive and I’m always ready for a break from birthday cake by the time my own birthday comes around. As for fall, I’ve been ready for a few weeks. We have had some miserably hot weather in Florida and I’m ready for a change. My daughter and I made these over the weekend. She had four of them for breakfast this morning and wanted to pack some for lunch. She has always been a picky eater too. Thank you for this recipe Taralynn! I cannot wait to try others. I’m looking out for your meatloaf recipe. I will post that meatloaf recipe soon! 1/8 a tablespoon? Or teaspoon? Thought it was a typo but you put it twice..
Aww, Grumples looks so cute in that picture! 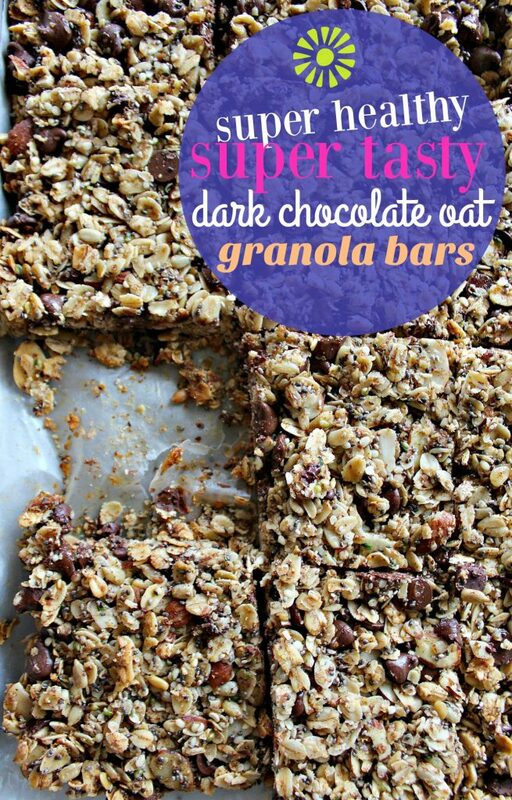 These granola bars look super yummy! 1. I love Nature Valley — they are always tasty. 2. July, for sure (including my own!). hi taralynn! You seem to adjust to obstacles and life changes so positively and quickly so I was hoping you could offer advice . I just moved to new city and am having a hard time finding places to make friends my age. My coworkers consist of older adults (I’m 22) and am wondering the advice you have to make friends when you don’t know ANYONE! I work out a lot at the gym but am not as good at playing sports which makes me hesitant to join a league. Any ways, how do you meet people and form friendships when you move?! Maybe something from your experiences will resonate with me! 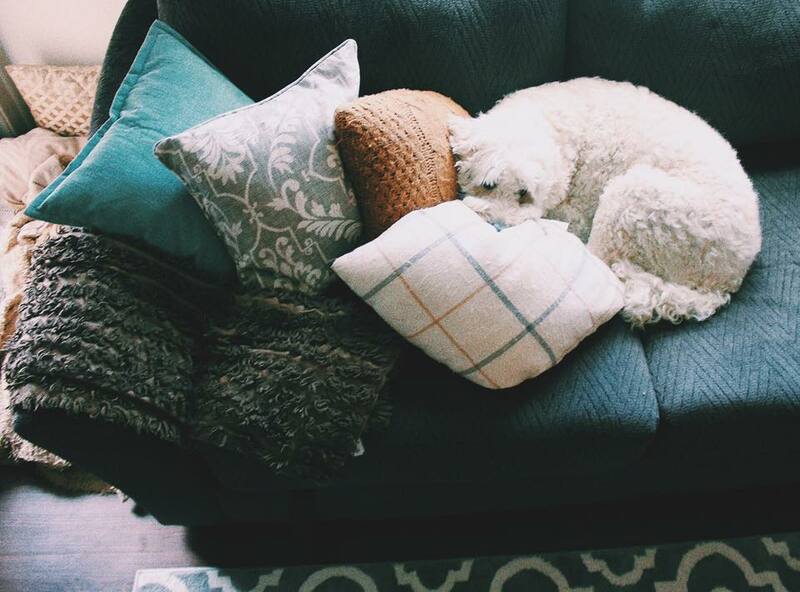 Moving can be hard and making friends can seem like something that’ll never happen. I’ve been to many places where I didn’t meet ANYTHING. You just have to put yourself out there and be very outgoing. Join running clubs, meet ups for things you enjoy doing, maybe (if you live at the apartment) hang out at the pool to meet people, and just go out and explore. Making friends will happen overtime. Start going to yoga classes at them gym or other classes where you can meet people too! I celebrate the most birthdays in January! One for my sister and one for my father, but in December there’s also my little brother and not to mention the entire season is festive and holiday-esque already! January is my birthday month 😀 I love all the holiday-esque in December! I can’t wait. 2) January seems to be birthday month for me (mom, brother in law, half of my friends…sheesh…I guess I really love Capricorns LOL). 3) Not ready for fall at all…in fact, I kinda don’t want summer to end! 🙂 But I am excited to finally wear cute boots and fall color nail polishes (I love a good oxblood and cherry red). Now, I just want to say, this is the first comment I’ve left on your blog! I’ve been following your blog for a looonnnggg time but have always been so shy to leave comments. Your journey has been so incredibly inspiring (especially your posts on self-acceptance and loving your body…something I’m struggling with at the moment). You’ve come such a long way; please know you have supporters/fans/blog followers that are rooting for you every step of the way. 🙂 I can’t even put into words how much I adore your blog! Yes those count for sure!Your mom’s bars sound delicious. I’m like that too. I’m LOVING the summer, but excited for fall festivities. It’s so hot here during the fall so it kind of stinks! I can’t bring out the boots until late october! Oooo…these look so yummy! 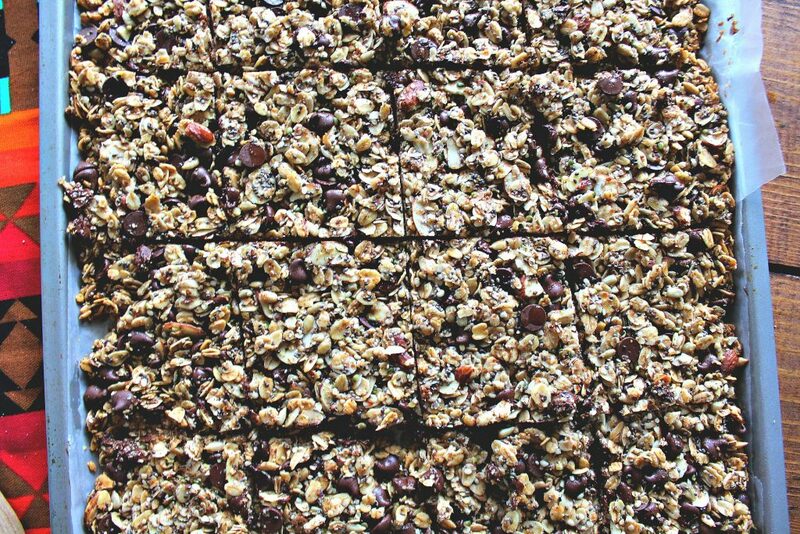 Any bread or trail bar with tons of seeds is delicious…. 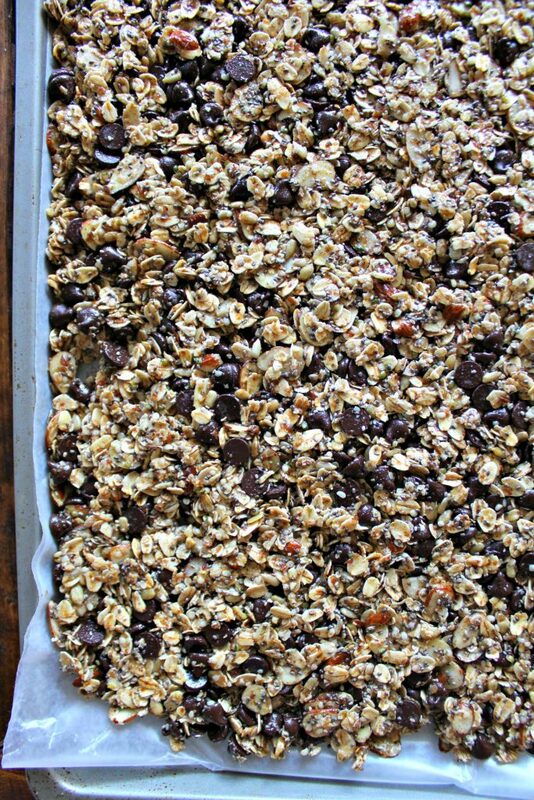 I should definitely try making granola bars for when we go camping. 1) Nature Valley Honey ‘N’ Oats bars. 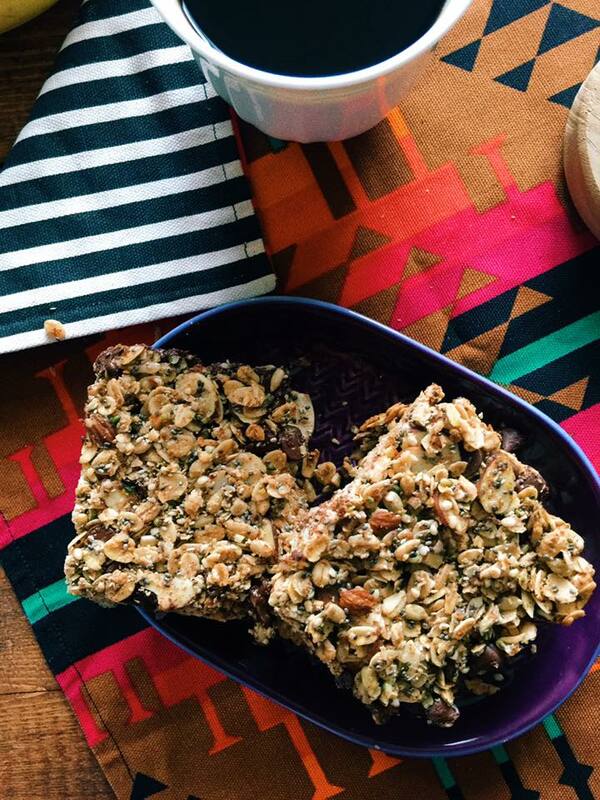 They’re pretty much one of the only granola bars that don’t give me headaches. 2) Now that I’m married, I think August will be the birthday month because my mom’s birthday is in August and my husband has several family members with birthdays in August. However, my husband Alexander and I both have birthdays in the latter half of December!!! 3) YES!!! And pumpkins and orange leaves and harvest scents and fresh veggies and cool afternoon runs and pumpkin spice and mugs of tea…. Hello Autumn! 1. YES I love those! 2. August is definitely the month of births! 3. OMG YES!!! I’m so excited for cooler afternoon runs. I love Larabars! These look really good too–i want to make my own more often to save money. I celebrate a lot of birthdays in December plus Christmas–so December is always a whirlwind! I love Larabars as well. It’s definitely a money saver making your own! 2. Hmmm…this is a good question. I would say July. Not only is it my birthday but my dad, cousin, uncle, and friend’s. Love Larabar too! Those are my two favorites as well. I like to freeze them! I feel like the summer is filled with birthdays! I am so ready for fall too! The only fall-ish things I’ve done is eat pumpkin spice cheerios and buy a pumpkin spice candle! Its SO HOT here until October so it’s so hard! 🙁 I feel a slight breeze and I’m excited. Love making pumpkin bars! 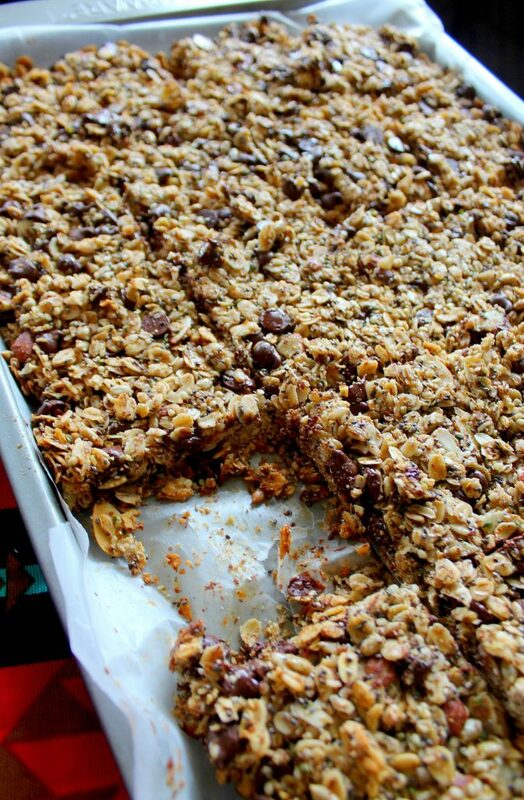 I love homemade granola bars!! I can’t wait to try these! All of my family’s birthdays are right together. Ours isn’t so much a single month, but a season! They start in June (with mine!) and then we celebrate birthdays for every member of my family (except my husbands) each month until October! We are kind of like that too (minus me.) My parents and brother’s are in August/September and I’m floating all the way in January! I hope you enjoy the granola bars! I seriously cannot wait for fall. On my run this morning, the weather felt fall like and I was super happy about that. It’s coming!! SO jealous of your weather! It’s going to be in the upper 90’s here this weekend 🙁 It’ll be like this for a while! We get late falls. Yum! So gotta try these! My favorite brand of granola bars Aren’t really granola bars but protein bars. 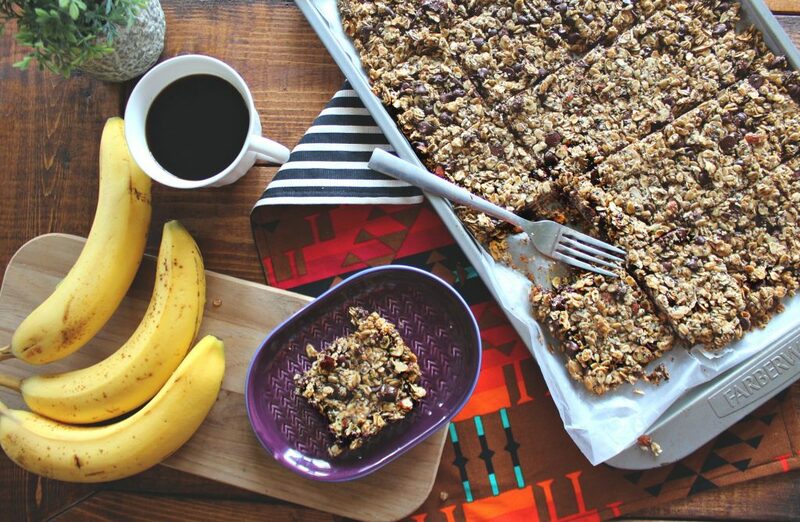 I love Oatmega bars. They taste amazing, the ingredients list is pretty clean and they only have 5g of sugar. Best bars I’ve found. March, May, July, & December are our busiest birthday months! I’m kinda ready for fall but kinda not. I had such a busy summer that I felt like it was kind of non existent. August is the month for birthdays for me too lol! I have 4 friends that have birthdays in the beginning of August. Mine is also on the 24 and my mom’s is the 31st. I’m very much ready for fall. My best friend and I are actually “fall” shopping tomorrow. We will be stocking up on all the fall candles and decor. Hope you have a great weekend! 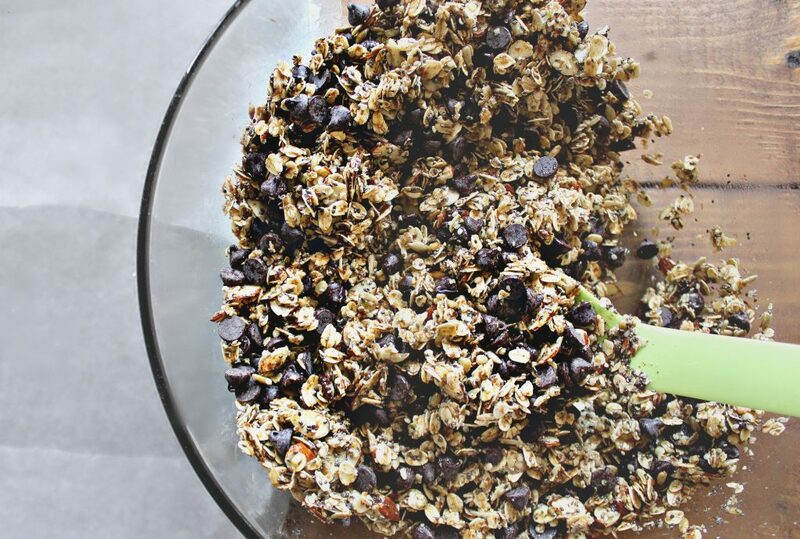 I can’t wait to try this granola recipe. Dark chocolate is my favorite!